What do you get when you cross a Rice Krispie Square, with A Reese’s Peanut Butter Cup? A happy Sammie, that’s what you get. My trainer would probably not be impressed that I made this recipe this weekend, but you know who was impressed? All the lovely folks I had over for dinner the other night. These are super quick and easy to whip up…a little too quick and easy. 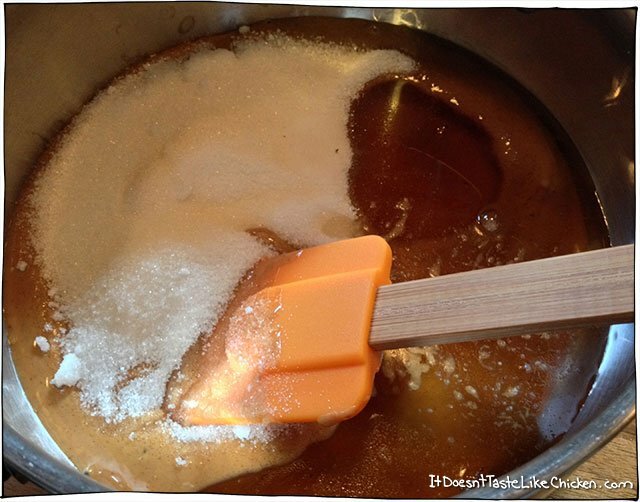 Put the peanut butter, sugar, agave, and salt in a pan. Heat over medium heat and stir to incorporate sugars. 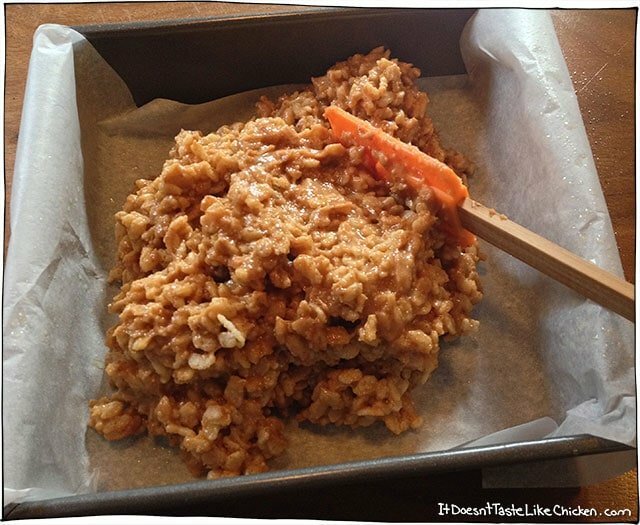 When peanut butter mixture gets hot and starts to bubble, stir in rice crispies. 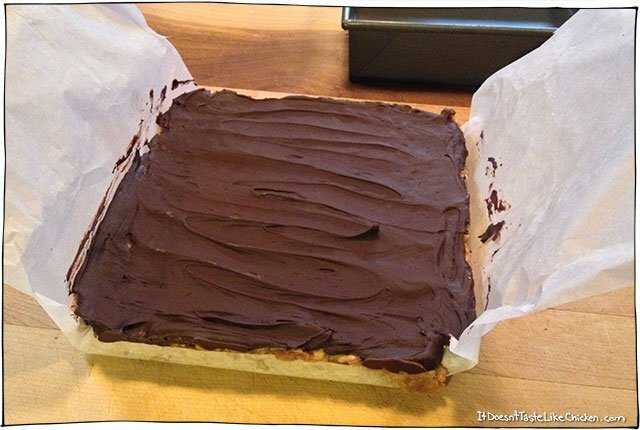 Scoop into an 8×8 pan lined with parchment paper and lightly greased. (This will make it easier to remove later). Pat it all down so it’s nice and even. 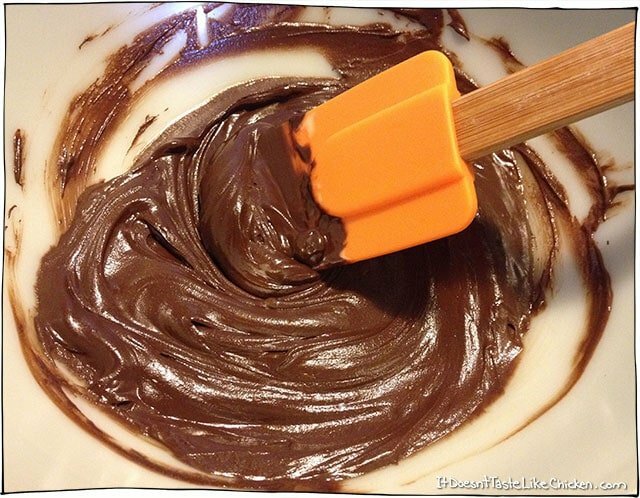 Melt chocolate chips and vegan butter in a double boiler. If you don’t have a double boiler (like me), find a heat proof bowl (stainless steel or pyrex work), that will nestle on top of your pot. Add about an inch or two of water to a pan, and fit a heat proof bowl on top, so it isn’t touching the water. Bring water to a boil. You have made yourself a double boiler. 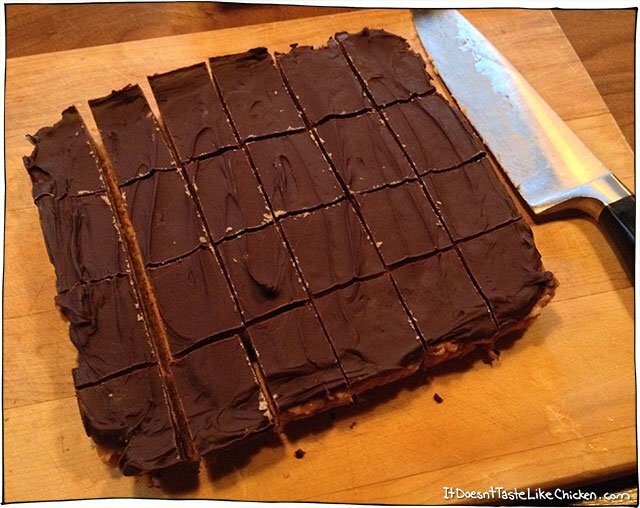 Once melted pour on top of the peanut butter crispy layer and spread around. Chill in fridge to set. Pop out of the pan using the parchment wings (see handy!). 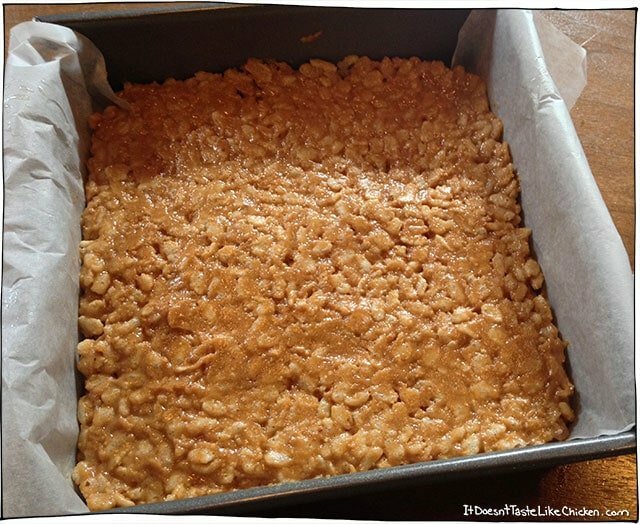 Hi, I didn’t see the recipe for Crispy Caramel Rice Squares from the cookbook on the blog so will ask my question here. I tried the recipe from the cookbook and thought I followed it exactly but my liquid never thickened after 15 minutes – it was still water consistency. I proceeded to put the rice cereal in anyhow but of course the hot liquid just made the cereal soggy. I poured it into the pan anyway and into the fridge. It’s now a soft (wet) square rather than a crispy dry square. What did I do wrong? I’d like to try again. How thick should the liquid become (once I figure out how to correctly thicken it)? Thanks! Hi Tammy, it’s difficult to know without being in the kitchen with you. Did you make any substitutions? Did you measure exactly? In the recipe, I said you should simmer for 15 to 20 minutes until the mixture is a rich golden caramel colour and the bubbling decreases. Did you reach that point? 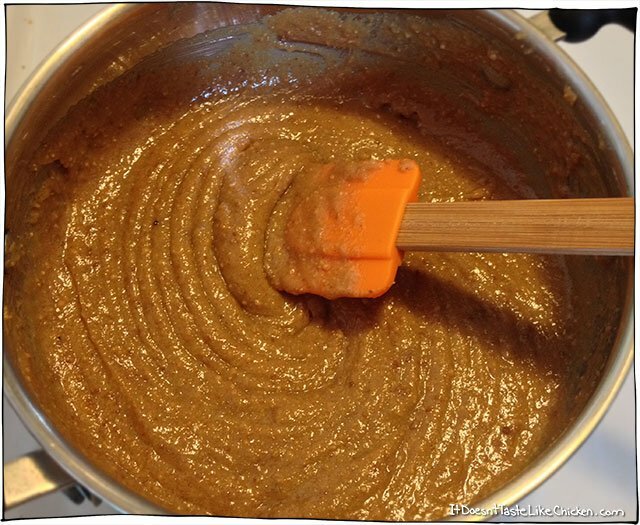 The colour, more than the viscosity or time is the guide to your caramel is done. Hope that helps! 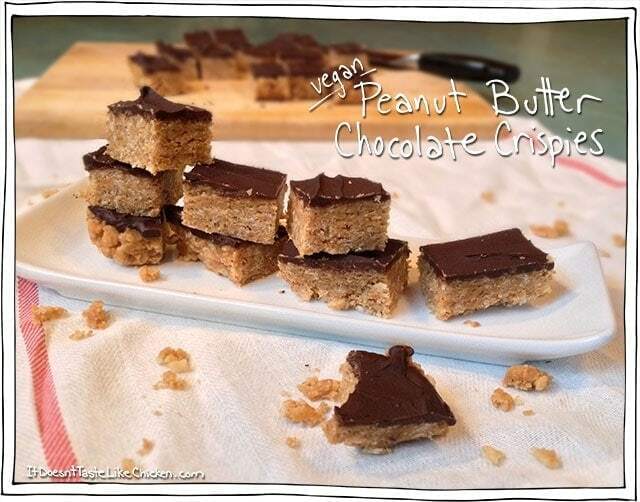 Can I make this peanut-free for school snack; & if so what alternative do you recommend. Yes, any nut or seed butter should work well. Enjoy! Do you have any recommendations for store bought vegan butter or do you make it yourself (& if so please an you share the recipe)? Tried these, so yummy! The peanut butter was very dry for me too, maybe its cuz i made it with less agave and coconut sugar instead. I added water to it and it turned into a creamy caramel! sooooo good! thanks a bunch! makin’ them again tonight!! Husband and I are in LOVE with these! 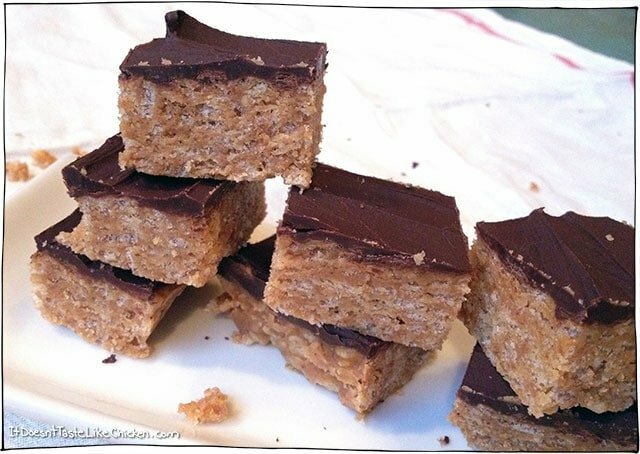 I swapped out the rice crispies for uncooked oats since we had none and it still worked wonderfully….and obviously no kiddo is going to reject these beauties so the whole fam is impressed!!! 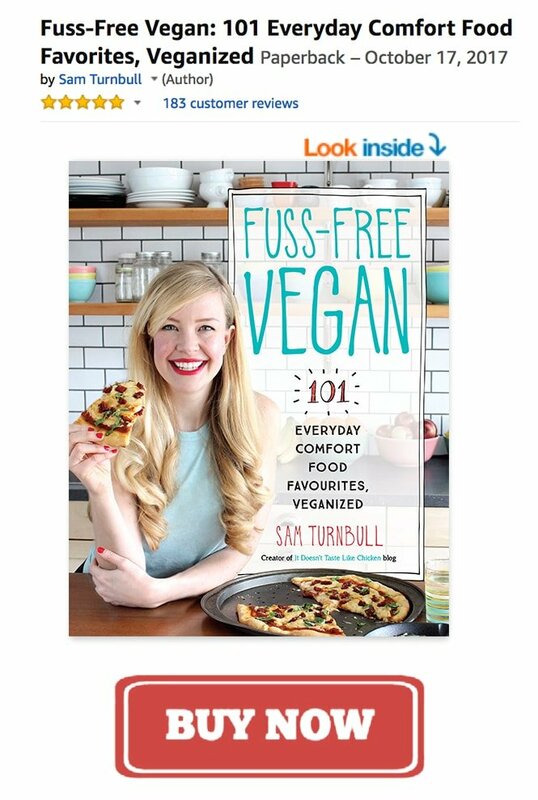 Excited to try more of your lovely recipes. Thanks and Blessings!!! Oh yay! So glad you loved them Brandalynn Ann! 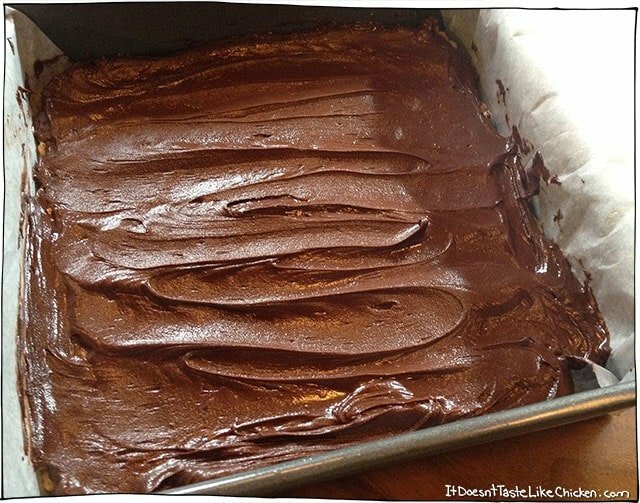 Some people seemed to have difficulty with this recipe so I’m very happy that they worked for you. Love the idea of trying them with oats. Yummy! My peanut butter mixture did the same and I had it in low heat( at 3 on a scale to 10 )and didn’t even cook it long at all. Like less than five minutes. It started out nice and wet but than got dry. I made this with my mother. Somehow the peanut butter burnt before it became gooey. I’m attempting to smoosh it all together with my hands, but the krispies just look dry and sad. Like if I had made playdough crispy bars. I’m hoping if I cover it with enough chocolate, my friends will forgive me and maybe not make me sleep outside at the cabin trip this weekend. Here’s to hoping. Oh no! I hope it ends up working out for you. It’s very quick, you basically just get the peanut butter mixture hot and then toss in the cereal right away. No need to cook for any length of time.